Home » VectorVest » Harry Potter still casts a spell over Bloomsbury Publishing #BMY revenues. Buy in run up to FY results next month, says VectorVest. Harry Potter still casts a spell over Bloomsbury Publishing #BMY revenues. Buy in run up to FY results next month, says VectorVest. By Alan Green in VectorVest on 11th April 2018 . 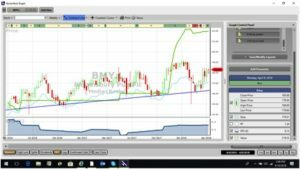 On March 19th2018, BMY published a trading update for the year ended 28 February 2018. The company said that revenues will be slightly ahead of expectations, but profits will be well ahead of the Board’s expectations. This follows excellent sales, particularly in January and February, with lower than anticipated returns, driven by certain titles including Tom Kerridge’s Lose Weight For Good, which has been number one in the Overall Nielsen BookScan UK chart for four weeks since its publication on December 28th 2018. In addition, the net cash balance is now expected to be around £25m, significantly ahead of expectations. Final results for the year will be published on 22 May 2018. An upward move in the GRT (Earnings Growth Rate) metric was picked up by VectorVest as far back as October 2017. This growth continued all the way through to today’s GRT rating of 22%, which VectorVest considers to be excellent. Although the RS (Relative Safety) metric only registers a fair rating of 1.00 (scale of 0.00 to 2.00), trading at 183p the stock is still way below the current VectorVest valuation of 219p per share. A weekly chart of BMY.L is shown above over the past two years. The share has recently been revalued positively by the VectorVest program. This is a strong leading indicator of a move in the share price. Technically the share has been trading sideways but charting rising bottoms as shown by the trendline on the chart which suggests a breakout in the share price. Summary: Historically of course, most of us subconsciously attribute any success enjoyed by BMY to the phenomenally successful Harry Potter series. VectorVest however have long appreciated that BMY is anything but a one trick pony: as publishers of Wisdens, Whos Who, Independent School Yearbooks and a raft of other publishing companies within the group, this is a highly resilient and investable company. The recent trading update provides further evidence of this, and combined with an excellent GRT of 22%, BMY is rated a buy at VectorVest in the run up to the results on May 22nd.